Six people were arrested after a group of men were ‘fighting with weapons’ in Banbury yesterday (Saturday, May 26), leaving two in hospital. Officers were called to the Middleton Road area to reports of a number of men fighting with weapons at around 5pm, police said. Two men were taken to the John Radcliffe Hospital for injuries - one has been discharged and the other remains in a stable condition, his injuries are not believed to be life-changing or life-threatening. The six men, all from Banbury and arrested on suspicion of assault, affray and GBH, remain in custody. Detective Inspector Jim Holmes said: "We are appealing for witnesses to come forward following this isolated incident of disorder and we believe the men involved were known to each other. "This incident happened in a busy street and a number of people would have witnessed it. "We are asking anyone who may have witnessed the disorder and particularly anyone with mobile phone or dash-cam footage of the incident to please come forward and call 101." 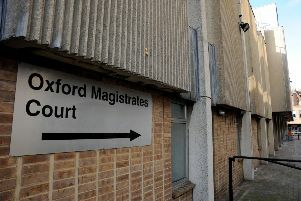 Those arrested are: a 37-year-old man from Banbury arrested on suspicion of assault with injury; four men aged 34, 31, 39 and 26, all from Banbury, arrested on suspicion of affray and GBH; and a 35-year-old man from Banbury arrested on suspicion of affray, theft and GBH. Anyone with information relating to this case is asked to call 101 quoting reference '1044 27/5/18', or contact Crimestoppers anonymously on 0800 555 111.